There's nothing worse than eagerly anticipating the arrival of lunchtime only to open up your lunch box and find a mess. Not only is it a pain to clean up on a hungry stomach, but there's less food now to fill said stomach! Been there, done that but no more. We've found five of the best no spill box lunch containers that are 100% leak proof – and made of non-leaching, recyclable and highly durable stainless steel too. So there's no concern about nasty chemicals like BPA, lead or phthalates leaking into your soups, salads, sandwiches and cereal. 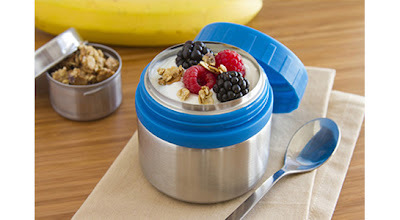 Lunchbots Rounds Screw Top Food Containers are ideal for breakfast-on-the-go. 1. Top of the list has to be Lunchbots rounds screw top food containers. Why we like them? They're multi-functional. Ideal for breakfast-on-the-go foods like cereal (with milk! ), yoghurt – and anything else that's drippy. These easy to open, recyclable stainless steel containers are just as great for dry foods too. Plus they come in a handy two-pack, one for each child. Can't wait for Lunchbots to add more 'girlie' colours to the blue and black containers available now. 2. If you like your dressing the side, these screw top stainless steel condiment containers are definitely for you. Why we like them? They're small, they're cute, they're just the right size for dips, dressings or sauces. The screw top lid guarantees this is a no-spill condiment endeavour. There's three of them, so you'll always have on hand. 3. For a hot meal, this double layered stainless steel food container is perfect. Why we like it? This double-walled thermal container not only keeps food hot, but you can pack along a side dish in the removable top layer. Pair chili, soup or pasta with a slice of bread on top. Made of quality stainless steel, this thermal food container features a silicone seal that's backed up with two clips to keep contents sealed tight. 4. If it's a single hot something you want to pack along, a great quality option is the Lunchbots stubbie thermal container. Why we like it? Ideal for soups, pasta, chili or rice dishes, these thermal food containers are short and wide – similar to a bowl – making them easier to eat from. Plus they come in a great choice of colours: pink, blue and green. 5. For any kind of snack or meal, you can't go wrong with these Clicks snap lock steel containers. Why we like them? First off, the lid is transparent so you can see what's inside without taking it off. Love this feature. Second, the snap locks on each side of this rectangular food container are easy to open and close, even for smaller hands. They also come in a two-pack, again economically priced and one for each child. Plus when you close the locks there's a loud 'click' sound giving you an added confidence that whatever you've packed inside will definitely not leak out! They also come in a survival warehouse products two-pack, again economically priced and one for each child. Win a FunBites Food Cutter - Giveaway!